The facility has four Storm Water tanks which store rainwater captured from the roof of the large training facility. The Master Plumbers Association of NSW Training Centre is the training school for plumbers and their apprentices in NSW. This complex is a state of the art facility which designed to provide both theory and practical training to the NSW plumbing industry. This centre is the newest and best centre of its type in Australia. The tanks are used to catch water from the building roof and has the dual role of providing detention and retention of rain water. The detention process catches storm water during rainfall events and then releases it slowly back into the storm water system, reducing the volume of water the storm water system has to manage during a storm event. The water is also retained in the tank and is used in the facility in toilets and wash areas as well it is used in the practical training area to suppress dust and to provide a practical environment for students. The four tanks are 46,400 litre SG1.2 Tanks with a range of industrial fittings to provide inlets overflows and outlets. The tanks and fittings were designed and manufactured specifically for the training centre and are housed indoors so they are close to the training operation. Bushmans worked closely with the centre designers to be able to provide tanks that suited their specific requirements. 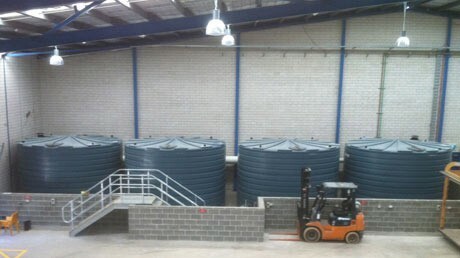 Bushmans was able to deliver these tanks to the middle of Sydney in a safe and professional way to site.